Street art is usually meant to disrupt its environment and to capture our attention, but the artists on this list practice a special technique that makes their artist even more eye-catching and playful – they tailor their art to its surroundings so that their (usually) 2D paintings seem to interact with their 3D surroundings. It would seem to me like the most difficult part of creating works like these might be the fact that each must be created for a specific site or even temporary circumstance. You can’t just paint a stencil or art piece wherever you find a good spot. Their ability to think of these wonderful pieces also speaks to these artists’ wild imaginations – where we see a vine and a brick wall or a railing, these artists see the opportunity to create something that will make us think or make us smile. There are artists who make work like this their MO. Oak Oak, Banksy, and Ernestas Zacharevičius are just a few examples of artists who regularly create awesome “interactive” street art – interactive in the sense that it interacts directly with its environment and somewhat less directly with us, the observers. Street artists aren’t the only ones who realize the value behind artwork that interacts with its surroundings – these brilliant ambient advertisements were also designed with this goal in mind. 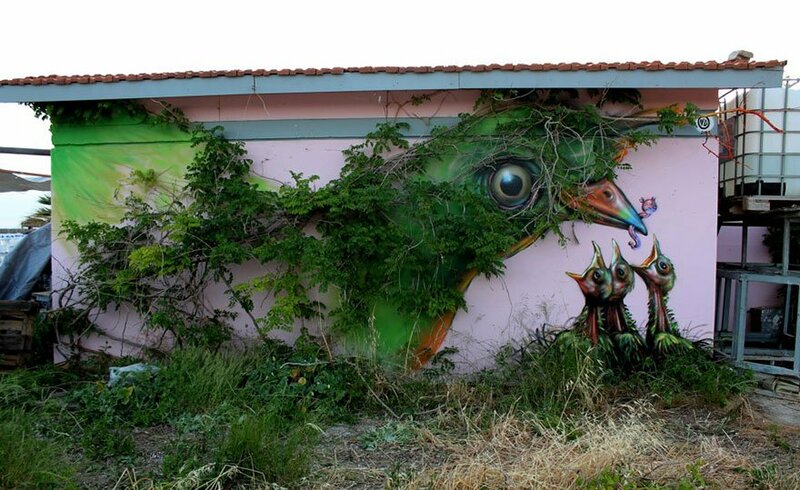 Have you noticed a piece of street art in your neighborhood that cleverly uses its surroundings? If so, be sure to submit it at the bottom of this post! What This Girl Did To Protest ‘The Australian Shark Cull’ Is Breathtaking!